Review: Famous author Adriane Oliver is creating a murder mystery weekend at a remote country house. She has a feeling that something ominous is about to happen so she calls in the assistance of her friend, Hercule Poirot. Poirot isn't sure why he has been summoned and isn't thrilled to partake in the festivities. However, when the local girl who was acting the part of the victim is actually murdered and the lady of the house goes missing, Poirot is on the case. 'Dead Man's Folly' had a good cast of characters including the enigmatic, rich house owner, his stupid wife, the zealous architect, a young couple visiting, the previous house owner and a youth hostel near by. The crime was committed during a large festival so reconstructing the crime and figuring out the time table was fun as a reader. 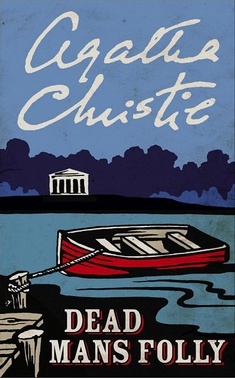 The only annoying thing was a lot of this book was written from Poirot's perspective and I prefer when he is a secondary character.